STOP HS2 | Budget promise on HS3 will be taking the highest cost option for another white elephant. As reported in The Independent on Sunday, Chancellor George Osborne intends to put more meat on the bones of the HS3 plans he first raised in June last year in his budget statement, in what he hopes will be a potential vote winner in the upcoming election. 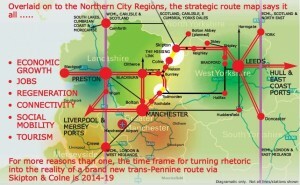 However, whilst he may claim that better Transpennine links are essential to create a ‘northern powerhouse’, the reality is that the current £440m project to electrify the current Transpennine link via Huddersfield was put on hold by Network Rail “Pending clarification of the project’s scope by the Department for Transport” (Download, Row 16, Column M) last week, with only 4% of the project completed. In addition, the DfT will launch a business case for HS3, in response to previous statements from Stop HS2, that HS3 has “No plan, no route, no budget and no timescale”. Electrification of the Transpennine route had been due to be complete by 2018 at a cost of £290m when Mr Osborne announced it in his 2011 Autumn Statement (See overlap of pages 31-32): , but a Network Rail report last November put the completion date back three years to 2021, with the cost spiralling to £440m. In his budget statement, The Chancellor is expected to put the cost envelope of the Trasnpennine HS3 at £7-10bn. Additionally, a report from consultants ARUP showed the 11 miles missing between Skipton and Colne could be restored with four tracks at a cost of £110m, creating a new Transpennine link, whilst reopening the Woodhead Tunnel linking Manchester and Sheffield could cost less than half a billion, and according to The Northern Way, would bring £10bn of benefits to the economy. ‘Scrap pacers’ promise ignores the reality of delay to the process. This cost order for Local Authorities will enable you to persuade yours to challenge HS2. Some LAs wrote letters to people in 2010 about the announcement and some groups started negotiating changes and still are when most of the people in communities are ousted from those processes. Read and apply the finding of the Court of Appeal and produce your Parish Council and Local/County authority submission to the Aarhus Convention it is simple. Do not feel guilty but take on the challenge to demonstrate where you were eliminated from alternatives through lack of public and group transparency. Many views and needs have been excluded from the alternatives for sites, access routes and power connector sites. A local authority is entitled to the costs protection conferred on claimants in Aarhus Convention claims, the Court of Appeal has ruled. In December 2014 the Court dismissed an appeal by the London Borough of Hillingdon and HS2 Action Alliance, which had been seeking judicial review of the safeguarding directions made by the Secretary of State for Transport for Phase 1 of the proposed High Speed Two railway. Mr Justice Lindblom ordered the council and the Alliance to pay the Secretary of State’s costs. There was no challenge to his decision to cap the Alliance’s costs at the maximum of £10,000 under CPR 45.41 and Practice Direction 45 paragraph 5.1. There was a dispute as to whether Hillingdon was entitled to costs protection. Mr Justice Lindblom capped the council’s liability at £10,000 and the Secretary of State appealed. In HS2 Action Alliance & Anor, R (On the Application Of) v The Secretary of State for Transport & Anor  EWCA Civ 203 the Secretary of State’s counsel accepted that PD45 paragraph 5.1 divided claimants into two categories: individuals claiming as such and not as, or on behalf of a business or other legal person, and all other cases – and that on the fact of it, a local authority claimant fell within the latter category. However, he argued that this apparently unqualified category of claimants should be qualified by the exclusion of ‘public authorities’ as defined in Article 2 of the Aarhus Convention. The wording of rule 45.41(2) made it clear that whether or not a claim for judicial review was an “Aarhus Convention claim” depended upon the nature, or claimed nature (see the last part of the rule), of the decision act or omission that is the subject of the claim”. It was plainly necessary to have regard to the Convention for the purpose of determining that issue, but once that issue had been resolved (affirmatively in the present case), further recourse to the Convention was unnecessary for the purpose of deciding whether the claim for judicial review was an ‘Aarhus Convention claim’ for the purpose of Section VII. Once it was established that a claim for judicial review was an ‘Aarhus Convention claim’ the costs liability of a party to that claim was dealt with in rule 45.43 and Practice Direction 45 without further reference to the Aarhus Convention. It would not be right to infer a limitation excluding ‘Public Authorities’ as defined in the Aarhus Convention from those claimants who can benefit from costs protection under paragraph 5.1(b) of Practice Direction 45 in an Aarhus Convention case. “To infer such a limitation would do that which the Government wished to avoid: it would undermine legal certainty and promote satellite litigation and thereby increase the potential for delay in the challenge process.” Inferring a limitation upon the type of claimant who could benefit from costs protection under Practice Direction 45 would be “doubly inappropriate” because CPR 45.43 expressly provided that the Practice Direction may prescribe a different amount for the costs cap according to the nature of the claimant. The Court of Appeal also rejected claims that Mr Justice Lindblom’s approach would lead to “bizarre consequences”, such as Central Government being entitled to costs protection if it challenged an environmental decision by a local authority. “In the great majority of cases, Central Government will be the defendant, not the claimant, in any environmental challenge,” Lord Justice Sullivan noted. Lord Justice Sullivan concluded that the provisions of the CPR and Practice Direction 45 were clear, and it was “neither necessary nor appropriate to refer to the Aarhus Convention in order to place a gloss upon the ordinary and natural meaning of the word ‘claimant’ in Practice Direction 45”. It therefore followed that the Secretary of State’s appeal must be dismissed. In the High Court Mr Justice Lindblom had accepted a submission from Hillingdon that while a legal person could not be both a public authority and a member of the public in respect of the same environmental decision, the two definitions were not mutually exclusive in all circumstances. Hillingdon’s counsel had argued if the environmental decision was that of the local authority itself, then it would be the ‘public authority’ for the purpose of the Aarhus Convention. But if the environmental decision was made by another public authority, and the local authority was challenging that decision for the purpose of protecting the interests of its inhabitants under section 222 of the Local Government Act 1972, then the local authority, as a legal person, was as much a member of ‘the public’ as ‘associations, organisations or groups’ that might be set up for the same purpose. However Mr Justice Lindblom’s conclusion was obiter. The Court of Appeal declined an invitation from the Secretary of State’s QC to decide whether this was wrong. It pointed out that any view it would express would also be obiter, given its conclusions on the meaning of CPR 45.41-44 and PD45. Lord Justice Sullivan noted that the issue was set to be considered by the Aarhus Convention Compliance Committee later this year, also in relation to HS2.